May 17, 2018 -- The FDA has approved the first in a new class of migraine drugs that aim to fight painful migraine headaches before they start. Erenumab (Aimovig) is the first of four new migraine drugs in the pipeline that target calcitonin gene-related peptide (CGRP), a molecule that's produced in nerve cells of the brain and spinal cord. About 39 million Americans live with the throbbing pain and nausea of migraine. Even though many drugs prevent and treat these headaches, migraine symptoms disable 1 in 5 people who get them. Aimovig is a monoclonal antibody given as a shot for people who have four or more migraine days each month. The FDA evaluated results of three patient studies in making its approval. In those studies, patients on average had one to 2 ½ fewer monthly migraine days either over six months or three months. In a news release, the drug's manufacturer, Amgen, said the list price will be $575 a month or $6,900 annually. Costs to patients may vary depending on insurance. Over years of research, scientists discovered that CGRP helps transmit pain signals in the brain. 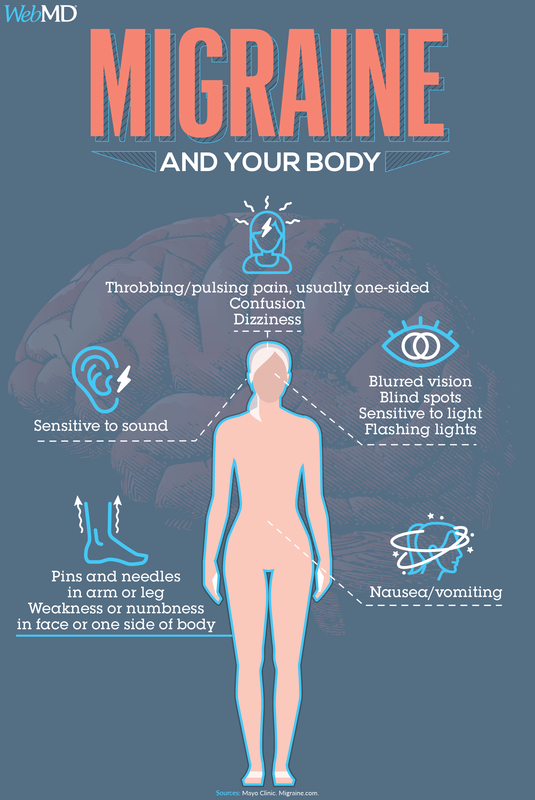 "We've believed for a long time that CGRP played a very important role in migraine, and part of the reason we believed that is because when people get a migraine attack, we can measure elevations of CGRP in their blood," says Richard Lipton, MD, director of the Montefiore Headache Center. CGRP doesn't trigger migraine, but it "dials up the volume" on headache pain. "It makes the nerve cells more sensitive to pain input. It's as if you have a radio and you turn the volume up and up and up," says Stephen Silberstein, MD, director of the Jefferson University Headache Center in Philadelphia. "If you block CGRP, you turn the volume down." Following close on Aimovig's heels are three other drugs that target CGRP: fremanezumab, galcanezumab, and eptinezumab (which is given by IV). Fremanezumab is under review by the FDA to prevent migraine and approval is expected later this year. It's in phase III clinical trials for cluster headaches. Galcanezumab has finished phase III trials for migraine prevention and is also being studied as a treatment for cluster headaches. Approval is also expected later this year. Eptinezumab is in phase III trials. Its maker plans to submit an application with the FDA later this year. It is for migraine prevention. While all of the drugs work on CGRP, they don’t all work the same way. Three of them target the CGRP molecule itself. Aimovig goes after CGRP's receptor in the brain. "You can think of the CGRP molecule as a key that unlocks a door to activate a particular brain mechanism, and you can think of the receptor as the lock the key fits into," says Lipton, who's also the Edwin S. Lowe professor and vice chairman of neurology at Albert Einstein College of Medicine. It's possible that if a CGRP-targeting drug doesn't work for someone, a drug that targets the receptor might, he says. "Monoclonal antibodies are designed to prevent migraine attacks from occurring. They don't necessarily prevent every attack, because there are attacks that can break through. But they reduce the frequency of these episodes," says David Dodick, MD, a Mayo Clinic neurologist and chairman of the American Migraine Foundation. Dodick co-authored the Aimovig research and consulted on the study design with its manufacturer. Studies show that the monoclonal antibodies cut the number of headache days by 50% or more in around half of people who take them. In a small percentage of people, these drugs eliminate migraine headaches. It's not clear how well they'll stack up against current migraine therapies, because head-to-head studies haven't been done. One downside to existing drugs that prevent migraine is they can cause unpleasant side effects like nausea, dry mouth, constipation, numbness, memory loss, and weight gain. These effects cause some people to stop taking the drugs. Side effects from the new CGRP drugs are generally mild, including pain and redness where you get the shot and nasal congestion. "They seem to be very well tolerated, and that's likely to lead to better adherence and better outcomes for patients," Dodick says. The new drugs also work faster than current preventive medicines. "For most of the available drugs, you have to start at a low dose and gradually escalate the dose until the treatment becomes effective," Lipton says. That process can take 1 to 3 months. People who take the monoclonal antibodies see effects within a few days to a week. Yet these drugs are not a "home run," says Elizabeth Loder, MD, a professor of neurology at Harvard Medical School and chief of the Division of Headache at Brigham & Women's Hospital. Loder, who hasn't been involved with any CGRP drug studies, cautions that these medicines don't work for everybody. And they may be risky for some people. "The big unanswered question is concerns over safety in pregnancy," she says. CGRP levels are lower than normal in pregnant women who have high blood pressure (preeclampsia). The worry is that biologics could trigger high blood pressure during pregnancy by reducing CGRP activity. "There is also a worry that they might cause high blood pressure in people who take them for long periods of time," she says. Because researchers have only studied these drugs for a few years, it's hard to know what long-term side effects they might cause. CGRP receptors are also found in your kidneys, pancreas, adrenal glands, and bones, and it’s not clear how the drugs will affect them after long-term use. Another big downside to the monoclonal antibodies could be their cost. Due to their high cost, "It's highly likely the monoclonal antibodies will be for people who don't respond to the less expensive medications," Lipton says. A study presented at the 2018 American Academy of Neurology annual meeting offers evidence that these drugs might work for people who haven't found relief with other drugs. In the study, more than twice as many patients who'd failed at two to four other migraine treatments had their migraine days cut by at least 50% with Aimovig, compared with placebo (a treatment with dummy medicine that has no effect). Further back in development is another group of CGRP-targeting drugs that are pills instead of shots. Although these drugs are designed to prevent and treat migraines, the only ones being made so far stop migraine attacks once they start. Two of these drugs -- rimegepant (Zydis) and ubrogepant -- are in phase III studies, the final study needed before the FDA can consider its approval. A few other drugs that work in the same way were in development, but their manufacturers discontinued them because of concerns about liver damage. Another new drug in the migraine pipeline is lasmiditan. It works the same way as triptans. But unlike the triptans, it doesn't constrict blood vessels, so it avoids some of the heart-related side effects. Its manufacturer, Eli Lilly, plans to submit a new drug application to the FDA in the second half of 2018. The variety of new migraine drugs on the way could give people with migraine more options and make treatment success more likely. "Migraine is really more than one disease," Lipton says. "The reason one person responds to treatment and not another may be due to fundamental biological differences we have not yet discovered." Biohaven: "Rimegepant pivotal phase 3 trial results -- conference call." Cephalagia: "ARISE: A phase 3 randomized trial of erenumab for episodic migraine." David Dodick, MD, neurologist, Mayo Clinic; chairman, American Migraine Foundation. Harvard Medical School: "CGRP: A New Era for Migraine Treatment." Jennifer Kay Dial, Eli Lilly Media. The Journal of Clinical Endocrinology & Metabolism: "Evidence for decreased calcitonin gene-related peptide (CGRP) receptors and compromised responsiveness to CGRP of fetoplacental vessels in preeclamptic pregnancies." Michelle Larking, Teva Pharmaceuticals Media. Richard Lipton, MD, director, Montefiore Headache Center; Edwin S. Lowe professor and vice chairman of neurology, Albert Einstein College of Medicine. Elizabeth Loder, MD, professor of neurology, Harvard Medical School; chief, Division of Headache, Brigham & Women's Hospital. MarketWatch: "New migraine drugs have promise -- and a $8,500 price tag." Mayo Clinic: "Migraine: Diagnosis & treatment," "Monoclonal antibody drugs for cancer: How they work." Neurotherapeutics: "Targeted CGRP small molecule antagonists for acute migraine therapy." New England Journal of Medicine: "Fremanezumab for the preventive treatment of chronic migraine." News release, Alder BioPharmaceuticals Inc.
News release, Biohaven Pharmaceutical Holding Company Ltd.
Stephen Silberstein, MD, director, Jefferson University Headache Center.